Here are some pictures of my kids, Tom aged 8, and Pearl aged 6. They pestered me for ages to let them have a go in the Echo and eventually I gave in. So what did they do? They just jumped in and rowed away, each of them in turn, with perfect form! Straight arms at the catch, nice leg drive, left over right and a nice high finish. Feathering seemed to come naturally. I couldn't get them to come back in! I never said a word to either of them before hand, and I was amazed by their proficiency, considering they had learned by just watched all of us doing it. Nice use of the tongue by both of them too! (Chip off the old block, obviously!) Feel free to use any photos you want. The Echo has well and truly arrived down under. These shots were taken at Sorrento, Victoria. I am so impressed with the Echo. I have taught a couple of dozen people in it since we got the boats and I have to say it is a marvelous little boat. 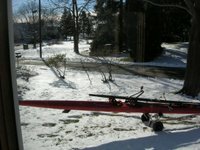 I also still enjoy rowing it myself, as I can go for miles on a workout without any problem with balance or waves and wakes. I am rowing about 15-20 KM a day in different boats. Next week I am delivering the beautifu l traditional Tasmanian sailing fishing smack ("Storm Bay") to Hobart, Tasmania across the notorious Bass Strait. I have selected the Echo to come down, strapped down on the deck. I want to row it in some of the most isolated and spectacular places in our Southern waters. We are headed for the Hobart Wooden Boat Festival. I'll keep sending the odd bulletin, and some pics of the adults rowing. Wow! Thank you so much for that fabulous introductory rowing experience. As I told you, I have not been a person who does physical sequencing very well, so I was extremely surprised at my first time rowing. You are such an excellent teacher - very clear in your explanations and instructions, very attentive in watching my body mechanics, and so very encouraging. And may I say again, Wow! I was amazed that I could row out in the creek with the fast current and wind. And most of all, I had several moments of connecting with my inner rower where I felt ONE with the boat, the oars, the water, nature, the universe and myself. It was a truly spiritual connection that is now in my cellular memory and I will not forget. In fact, I want more! and I look forward to our next lesson. Thank you, thank you for introducing me to rowing. 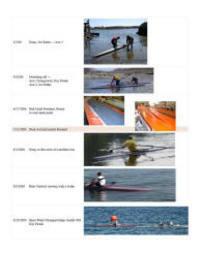 Echo designer Doug Martin has complied a timeline of the design of the latest Echo Rowing shell, the Ace. In this timeline, Doug describes the creative process behind the design as well as a step by step look at the prototype construction and test rows. Click to see a full sized version of the timeline to view or print. A new screen will open with a PDF version of the 4 page timeline, complete with photos. Yesterday was an amazing day to be out in the Atlantic in the new ACE. No waves to help show off the stability, but lots of tranquil beauty. 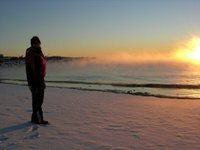 I was out for an hour in the morning "arctic sea smoke" but didn't have a camera, so we are sending a couple cool shots of that too. 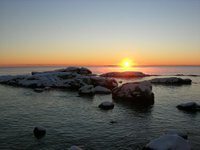 Hope you enjoy the ACE photos that Samantha took from the Wallis Sands Beach area of me rowing around "Seal Rocks." I'll send a few more shots in a following message, as these are just the "prelude." I'm incredibly confident that 2007 will bring enormous success to open water rowing enthusiast's with the introduction of the new ACE. I keep hearing a memorable quote in my mind from the fastest Maine Rowing Association members after testing some of Doug Martin's prototype ACE boats in Camden (Sept. 10th 2006): "This boat will allow recreational AND competitive rowers to use the same boat during early morning OR afternoon workouts." During the last week of 2006, I've had the most remarkable time in my Echo, and ACE (prototype) while wearing the same clothes as I do when running on the roads. 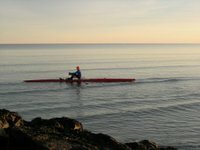 Truly, these boats allow people to row in peace, comfort and confidence during the large variations of open water conditions along the northern New England coast. HAPPY New Year to everyone in the ECHO office and shop!